An International gathering of world leaders in science met in Geneva to discuss their latest findings. Each nation took a turn sharing its latest developments. The leader of one nation stood before the group and declared that they had devised a spacecraft which would allow their astronauts to fly directly to the sun. He was met with boisterous laughter from the audience, to which he boldly replied, "I know what you're thinking, but we have a plan. We're going to fly the ship at night!" Just about everybody knows that you can't fly directly to the sun, for several reasons, not the least of which is that you can't even land there because there is no there to land on. 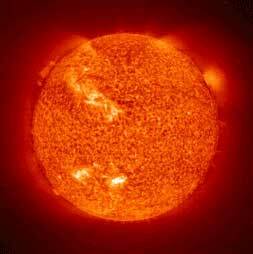 The sun is a star, which is an enormous ball of burning gases. If you remember from your science lessons in school about the three states of matter (solid, liquid, gas) you remember that gases are not solids. In order to land and stand on any celestial body, it would need to be solid because we are solid. Oh yeah, for us to fly anywhere near the sun we would have to build a spacecraft that could withstand over 1,000,000 degrees Kelvin AND keep the people inside protected from not only the extreme heat, but the intense light and solar radiation. Human beings were built to withstand the intensity of the sun from the distance of earth, not any closer. Even at this distance, too much exposure to the sun can be dangerous. Besides, we don't really need to fly to the sun to study it, we can make observations from afar (it's much safer). You would probably think of the sun as very old, as it is estimated that the "birth" of the sun happened 4.5 billion years ago. Things that grow old usually die, but 4.5 billion years is young for our sun. It is estimated that there is enough fuel in the interior of the sun to keep that lamp burning for about another five billion years, growing twice as bright as it is now. The source of the sun's fuel is hydrogen and helium gases. Through a special chemical reaction, called nuclear fusion, the hydrogen gas is "burned" releasing an enormous amount of energy in the form of light and heat. Of course, there's a LOT more than just two atoms smashing into each other in the center of the sun. There's so many nuclear fusion reactions happening inside the sun at any given time that we don't have a number big enough to count them! The light and heat energy travels from the core of the sun to its exterior (the photosphere) where we see it from earth (during the day). It takes a million years for the energy from a single nuclear fusion reaction in the center of the sun to reach the surface. Find out sunrise/sunset times for any day of the year. The sun is so powerful we can harness the energy from it to make our lives easier - ever heard of solar energy (using the heat from the sun to heat the water for your house)? Now that you know a little more about the sun, solar energy has a different meaning. True solar energy comes from the nuclear fusion reactions of the sun's interior. From the knowledge we have gained about about nuclear science we have developed of the Hydrogen bomb and nuclear energy. Here are some images of solar flares, taken from different angles. The photo above is a magnified view of the surface of the sun, looking directly down on a flare. The photo below shows a view of a solar flare from the side, projecting out into space. The sun is a dynamic star exhibiting changes in its intensity over time in cycles of warming and "cooling". From knowledge scientists have gained about the sun this century we know about a phenomena called sun spots. Scientists are trying to understand what causes these large spots on the sun; why they happen and what effect they have on the sun's activity. They appear to be large regions of the sun's surface that are significantly cooler than the rest of the sun (about 3800 degrees Kelvin, as opposed to the average 11,000 K). By examining temperature data that has been gathered all over the world for the last three hundred years it appears that sun spots effect the kind of weather we have here on earth. One of the hottest things about solar activity is the phenomenon of solar flares. A solar flare happens when there's a sudden change in the magnetic properties of the sun and GIGANTIC flares of burning gas leap out from the sun's surface. These flares extend for hundreds of thousands of kilometers into space and their intensity is such that it effects life here on earth. Communications devices that rely on transmission of radio waves (television, radios, cellular phones) can be affected by increased interference, or noise and power lines can experience major power surges.